Bahujan Samaj Party (BSP) leader Mayawati said the party had left it to her to take a decision on the issue. “The decision on the BSP continuing outside support to the UPA will come soon,” she said. managers will have to constantly negotiate her support on every issue. depends on me. I can pull the plug whenever I want. you all know”, she said in a rather cheerful mood. work harder for poll preparation. If yesterday she had made an indirect attack on Sonia Gandhi by talking about leaders who read out their speeches, today she blasted Prime Minister Manmohan Singh for pursuing “anti-people” policies. The rising prices of essential commodities and corruption were in focus. asked to fight against the “anti-poor policies of the UPA government”. “war-footing” for an early parliamentary elections. Ms Mayawati also announced a nation-wide agitation against corruption and the “anti-people” policies of the government. the multi-brand retail to global supermarkets. future but currently we do not support it,” she said. base in the state including the poorer Upper Castes. She is now an MP from the Rajya Sabha – the upper house of parliament. saying a decision on the issue will be taken soon. place any time” in view of a state of “instability” at the Centre. “But there will be no delay. The decision will be taken soon and conveyed to you,” she told reporters after the meeting. sections of the society, including SC/STs and minorities. Ms. Mayawati said that prices have spiralled due to the “wrong policies” of the government. want to emerge as a balance of power,” she said. She alleged that corruption was rampant in this government and no concrete steps have been taken to check it. elections are held,” she said. 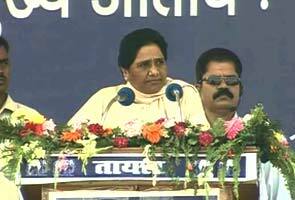 The BSP leader said that her party was confident that it would perform well in Lok Sabha elections this time. “Uttar Pradesh under the present regime has been transformed into a crime Pradesh,” she said. meeting of the BSP here. However, in contrast to her vitriolic attack on the Akhilesh government, as she dubbed the decision on FDI in retail a suicidal move, Ms.
cancelling the public holiday on October 9.
schemes, hospitals, parks and memorials,” Ms. Mayawati said. dacoity and robbery had reached a new high under the present regime. “likelihood of the LS poll being held before the scheduled time,” Ms.
We will meet tomorrow and discuss whether we should continue to back the UPA government or not. We don’t support FDI in retail in the current situation, but if it helps farmers and people we will reconsider our decision. Cannot rule out the possibility of early elections. You must not get swayed by UPA’s dynasty politics, don’t encourage them. Otherwise UPA govt will come to power again and you will face anti-people policies again. been given land by any other party - their lands have been taken away. “It looks as if Lok Sabha polls could be held earlier,” she said at the well-attended rally. the people including the deprived, SC/STs, minorities and farmers. We have gathered here in lakhs to pay our tribute to Kanshi Ram - I thank you all for coming. declaring a day of mourning in the country when Kanshi Ram died. October 9 was declared as a state government holiday by us but that was rescinded by the SP govt three days ago. hospital on the land around the park or tamper with the statues there. You must never forgive the other parties for the treatment meted out to Mr Kanshi Ram. We must expose their casteist mentality. He (Kanshi Ram) gave me the entire responsibility of the movement to me - the sole inheritor of his political legacy. I have been trying to take the movement forward in his name. many institutions named after Kanshi Ram and other Dalit leaders. The state government has not only broken my statue but also a dozen statues of Dr BR Ambedkar. The bill to get reservations for backward classes is still pending in Parliament. The SP’s role has been particularly heinous in this regard. I have put down my view in this book, which will be given to you. classes are feeling ostracised and they are being targeted. We had kept the interests of the OBC community in UP at the forefront and that included Yadavs. We also do not see them particularly interested in promoting the interests of the Muslims in UP. The law and order situation in the state has also deteriorated after the SP came to power. People of this state will regret voting this government I had said - and this has come true. We don’t have rule of law in this state - it is being ruled by the goons and mafia of the Samjwadi Party. Those whom we had put behind bars were set free by this government. members handling the buffaloes of upper caste persons. inclusiveness to allow entire society to benefit from it. Samajwadi workers and ministers are extorting money for party funds from officers. The present CM is a bigger “announcement CM” than his father. They are inaugurating projects which were initiated by my government - like the Noida-Agra Expressway. found on the black market. then make a little money on the side. The SP has stopped many of our welfare schemes to take political revenge against us. Common people can’t get anything done by government officials without paying a bribe. Samajwadi is constantly making allegations about corruption against me but they should examine their own record. a poor woman’s problems. What will she do with it if she has no food? If any of my relatives tries for tickets from our party or any other party, then I will break off all relations with them. I had planned to come to the rally by helicopter and not by road, but the Akhilesh government didn’t give me permission. Mulayam Singh Yadav and his son will not be able to save them. to me ; I thank you for that. I must tell my brothers from Maharashtra who have come here in large numbers - the state has been the karmabhoomi of BR Ambedkar. You have great respect for him, but when it comes to elections that doesn’t reflect in your ballots. I must appeal to government officers that while they cannot be involved in politics, they can raise awareness. promotions will be taken care of. that hid it for a while. moon freed from a cloud. 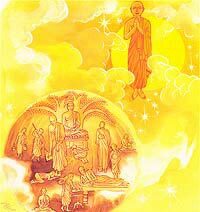 lights up the world, as does the moon freed from a cloud.